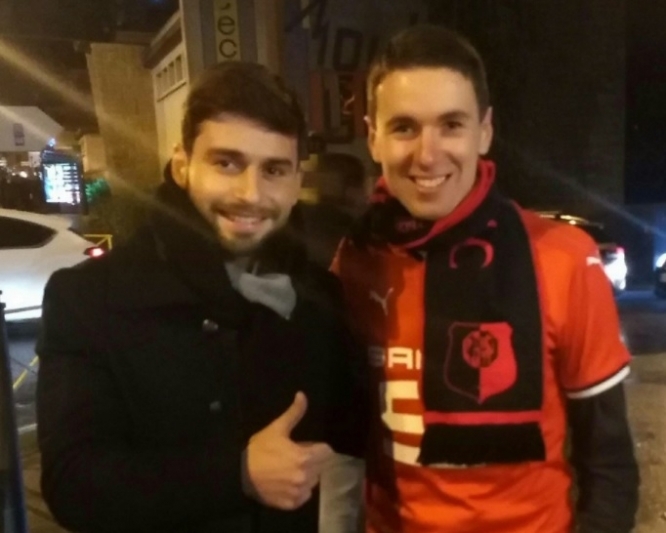 A French football fan received a rather unusual surprise this week when one of his favourite players, Sanjin Prcić, tapped him on the shoulder and offered to pay for his food. Football fan and U15 football coach Florian Jan was queuing for a sausage pancake (galette-saucisse) after watching Stade Rennais win 2-1 against FC Nantes on Saturday, and was wearing his own replica football shirt with Prcić’s name on the back, when he felt someone tap his shoulder and ask “Alright?”, reported French news source 20 Minutes. He turned around, and was astonished to see Prcić himself, walking through the crowds with his family, apparently unnoticed by fans. The player, who is Franco-Bosnian and plays for Stade Rennais, then offered to pay for Jan’s snack (although ended up not paying anything, as Jan had already paid!). He had tapped on Jan’s shoulder thanks to his wearing of the Prcić shirt, Prcić reportedly said, and was very happy to speak to a fan. As well as an avid football fan, Jan is also a football coach for an Under-15 team at a club in Vignoc-Hédé-Guipel (Ille-et-Vilaine), and posted a photo of himself and Prcić on Twitter to celebrate the unusual moment.